The DDN25 is a solenoid valve can operate work pieces under any vacuum level with low dimension. It has 2 way and 2 position valves that has double shutter. 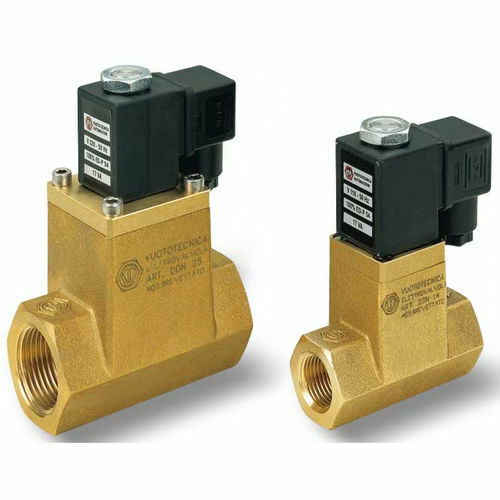 The direct drive valve is comprised with an internal mechanism, hot pressed brass body, which consists of the connections and actuator that is run through an electric coil. The basic electric coil is made from full plastic which has an insulation class F or up to 155 °C and created based on VDE specifications. Its three terminal electrical connections has a diameter of 6.3 mm and manufactured based on the compliance with EN 175301-803. The device has a protection level of IP 54 and IP 65 which comes with an inserted connector.